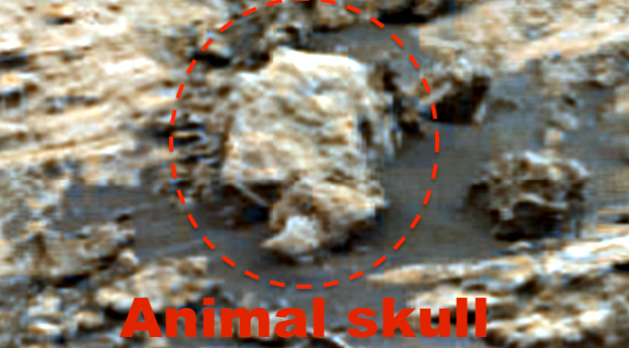 UFO SIGHTINGS DAILY: Animal Skull, Crude Facial Sculpture Found On Mars In Rover Photo, Feb 8, 2019, UFO Sighting News. I was looking through some gigipan photos of Mars and found some really strange objects, each of which tells it own story from its detail. First is the skull above which has a lower jaw beak like a turtle or even the upper and lower beak of a triceratops dinosaur. 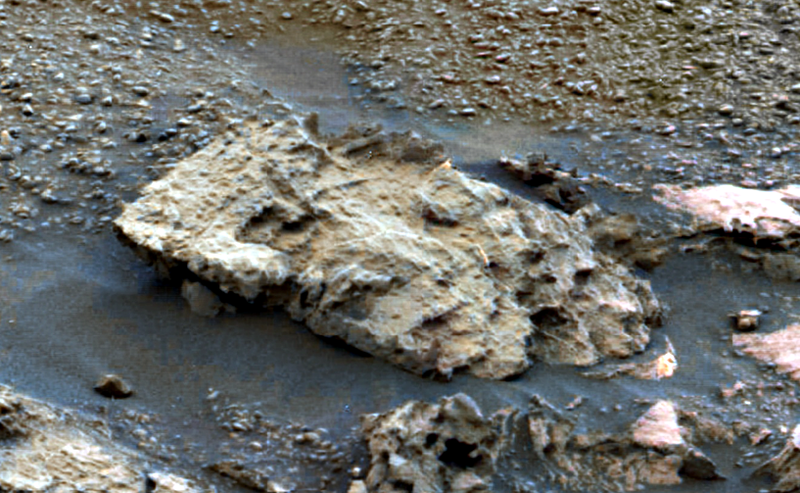 The detail is extraordinary and had the rover spotted it, it would have intrigued world scientists for months. I believe this is a sculpture...since it lacks the upper face details most fossils would defiantly have. There was also a flat sculpture of a bearded face. 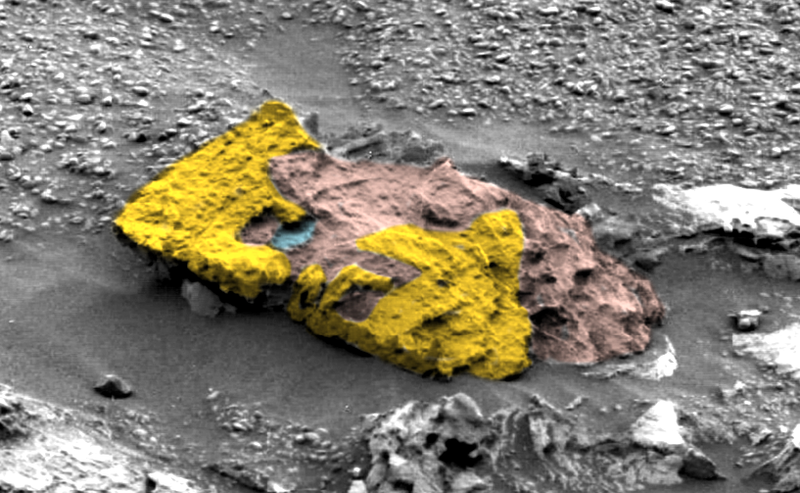 I added color to it to more easily see the details due to its crude and aged appearance. It would appear that the culture that made these were of lower intelligence...like that of prehistoric earth. Did you notice his ear is lower than ours? 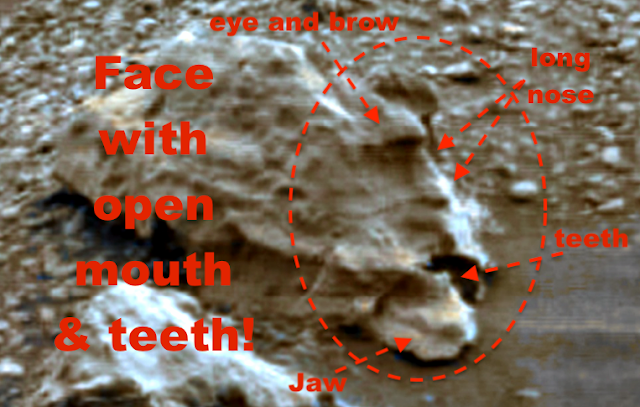 Then at the bottom of this post is a screenshot of another face...again a old male with an open mouth and high detailed lower teeth and jaw. His eyebrows, eyes, mouth nose, cheeks all highly stand out. These sculptures are undeniable proof that aliens...intelligent or not...once lived on Mars. 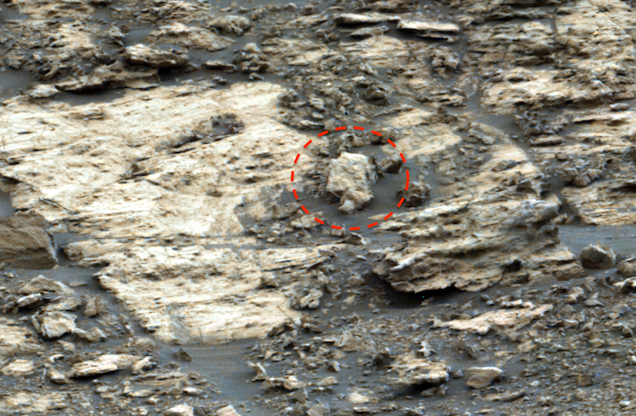 I would also like to add something...this ancient society on Mars...is a male dominate culture. I find very few female faces and most the faces I find are male with beards, crowns, moustaches, aged older males with wrinkles. That alone may account for a large reason why their species went extinct...they dismissed the intelligence and ingenuity of the females of their species, thus increasing the odds of destroying themselves and their society. Male and female combined intelligence creates a balance and increases the chance of survival of any species.